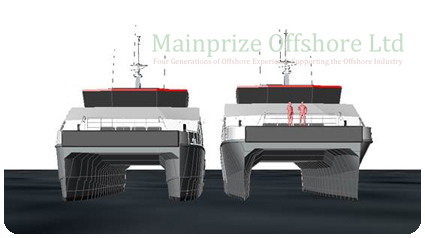 With the provision for 4 x 20' containers, 20,000 litre fuel oil capacity, 20,000 litre fresh water capacity, and 30t of deck cargo, the 23 metre WFSV designed for Mainprize Offshore has a huge capability. Other vessel features include a dedicated 3 point mooring system, fuel transfer system, and fresh water transfer system. The vessel is fitted with twin Caterpillar C32 diesel engines driving fixed pitch propellers that will gives the vessel a service speed of 26 knots even when fully loaded.